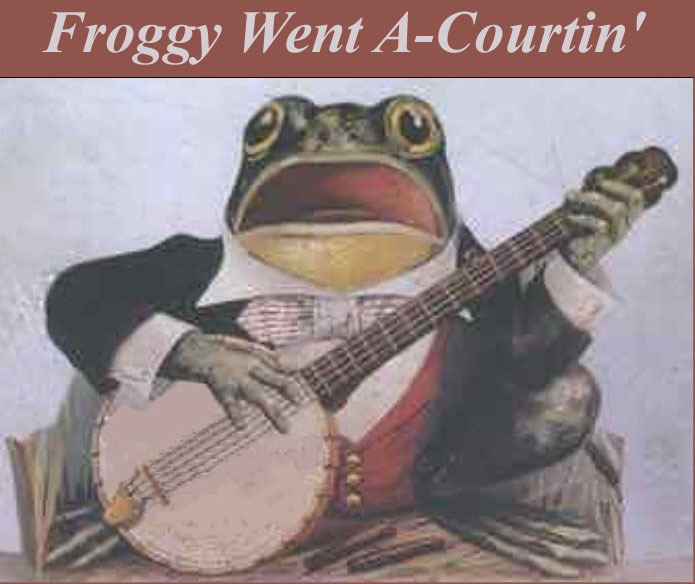 Note: This song is in two keys, G and C.
Froggy went a-courtin' and he did ride, Uh-huh, Uh-huh. Froggy he rode up to Miss Mousie's door, Uh-huh, Uh-huh. Froggy said, "Miss Mousie, are you within?" Uh-huh, Uh-huh. Froggy said, "Miss Mousie, are you within?" "Yes, kind sir, I sit and spin." Froggy took Miss Mousie upon his knee, Uh-huh, Uh-huh. Froggy took Miss Mousie upon his knee, Said "Miss Mouse, please marry me."